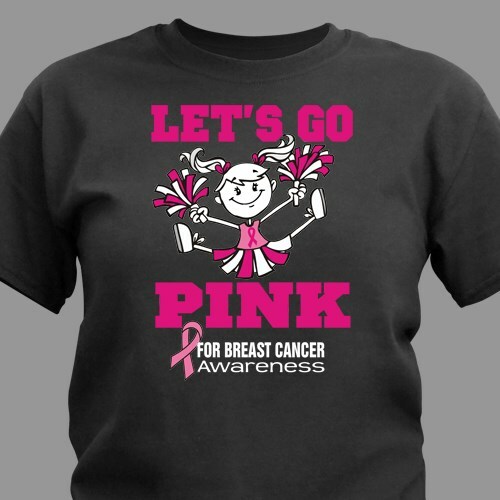 Go Pink for Breast Cancer Awareness every time you show your support wearing this fun Awareness T-Shirt. Our Let's Go Pink design is sure to catch the attention of all when joining your community awareness events or just out doing your day to day activities. This Breast Cancer Awareness design is printed on our premium, pre-shrunk 100% cotton t-shirts, machine washable in youth sizes XS-L and adult sizes S-3XL. Lots of great comments from everyone at the MSABC walk I went to. Additional Info October is Breast Cancer Awareness Month, but that doesn't mean you can only show your support during this limited time. Show your never ending awareness all year round with our collection of Breast Cancer Awareness Apparel and Walk Gear. This eye-catching design is also available in our Go Pink Sweatshirt and our Go Pink Hooded Sweatshirt.